It is a time of celebration and decoration with colors abound, glittering gold and silvers, twinkling lights, delicious recipes and sips of red wine. It is indeed the time to create harmony in your home with simple planning and budgeting to make your home look spectacular. 1. Decorate the door and house front - Make your own wreaths by bending greenery into a circle or any other shape and tie together with a string, ribbon or robe. Make a bow or use some Christmas ornaments for added colors and then hang it on your door. Tie jingle bells to your door handles to welcome a burst of Christmas! 2. Paint the Pinecones - Dip pine cones with gold and silver paints. Add glitters to create sparkling effects to hang them on your Christmas tree. 3. Candles - if you have wine bottles of different shapes, sizes and colors, create a unique twist to evoke the warmth of the holiday. Keep scented candles to add a special aroma, which can change the mood of anyone who walks in. 4. Light the tree and place ornaments Beyond the Christmas tree - Create a Christmas tree on any wall with strands of light. Hang the ornaments all over the house (inside & outside) to spread the Christmas cheer throughout. Try stringing a row of Christmas balls along the windows. 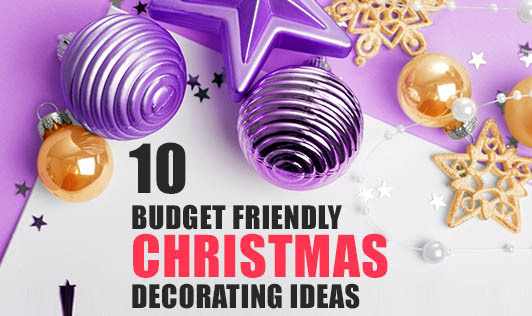 For a sophisticated decoration, spray little snow on the tiny shrubs and branches of the Christmas tree. 5. Tie bows - Tie colorful ribbons on the Christmas tree, chairs, windows, cushions, pillows and where ever possible. Some of these can actually look like Christmas gifts. 6. Fill the vases - Nestle flowers, twigs and other greenery with water for more decoration. Brighten it up with cranberries and cherries. 7. Light your home - lighten your driveway, path, staircase, living room and the centre of your dining table with homemade luminaries for a warm Christmas decoration. 8. Gift wrappers - If you are running short of ornaments to decorate, use the wrappers to give an extra appeal to the frames, jugs, vases etc. 9. Bowl of candies - For quick, sweet decoration, put bowls of colorful candies in pretty stemmed glass wares. 10. Cook up - A cookie tree, plum cakes and gingerbreads enhance the festive feel of your home, adding to the wonderful aroma! Invite kids to help decorate your baked goods with their favorite lollies. As you can see, decorating your house for Christmas need not be expensive. You just need bags of creativity and imaginations to flow. Try to involve your family and friends to ring in the spirit of Christmas. Happy decorating for the Christmas to come!